A deeply dejected and disappointed President Maithripala Sirisena stormed out of the Cabinet meeting this morning after making an emotional speech over the personal attacks levelled at him by the certain members of the UNP, a senior Cabinet Minister said. 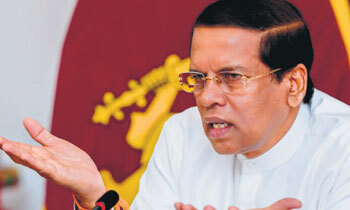 President naming those UNP Parliamentarians, who are making statements against him, had also said that a country cannot be ruled in this manner. He has informed the Ministers present that the Presidential Commission was established by him not to attack the UNP, but to punish the thieves and requested the Ministers to state whether they agree to punishing the thieves or not. The President who arrived for the Cabinet meeting carried with him a Tape Recorder, and showing it to those present he had said” Some may like to listen to my speech and some may not. But I will make this speech and those who wants to listen to it can do so later”. President thereafter had spoken for about 35 minutes continuously and had the speech recorded. Not getting the extra year has jolted him and is coming for a Nervous Breakdown ! you are correct ... spot on. MS feels insecure from MR and gang after the 5 years. He did a mutty test with the Adikaranaya! Yet another proof to prove the fact that, this govt cannot take the country forward but to make it more chaotic! Sad! But he is doing much better than previous dictator. Sir,this was on the cards from the day you became the chairman of the party.your own SLFP members who were against you and joined you later are responsible for this.at the end of the day the shadow of MR is around you in different ways.even the general public were aware of this. People living in glass houses should not throw stones. If they do they should be willing to get stones thrown at them as well. Running away after attacking one party is childish politics. Cant take the heat..... then get out of the kitchen. What the UNP has forgotten is that if MS did not have the courage to step out...UNPers would have had none to vote for - and MS has displayed more foresight than RW - just take the case of those responsible for the bond that has bound the UNP....he has not been gullible either! Did MS walked out with his trademark, eating a hopper from the canteen? This country is heading somewhere we never expected.PM must resign.